Peanut butter is great for quick snacks and lunches. Can this tasty treat actually help reduce obesity and diabetes risk? Eating a peanut butter sandwich or snacking on a handful of peanuts will not only fill you up but will also reduce your risk of diabetes. Eating peanut butter may be effective for preventing obesity, losing weight, and even lowering the risk of type 2 diabetes according to multiple studies. Adding peanuts or peanut butter to a meal with highly refined carbohydrates can decrease blood sugar spikes and help keep blood sugar levels more even throughout the day. 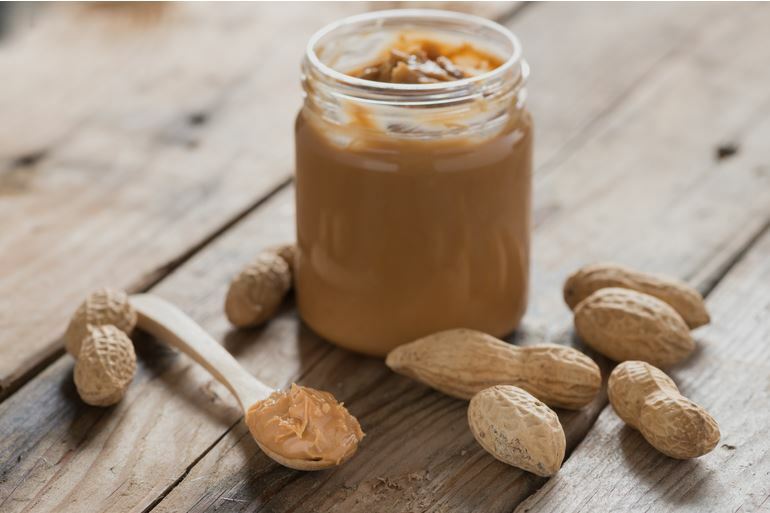 Peanuts and peanut butter are both low GI and GL foods, due to their high amounts of healthy oils and protein that help sugar to be released into the blood stream more slowly, keeping energy levels high and appetite in check. Higher GI foods can cause blood sugar and insulin to spike soon after eating, followed by a drop in blood sugar to levels lower than before consumption. Peanut butter is known to help lower blood sugar spike when eaten with refined carbohydrates or high GI food. Carol S. Johnson, Ph.D., conducted a study at Arizona State University where a few researchers compared the blood-sugar levels of two meals one with and one without peanut butter, as reported by the Peanut Institute. One meal consisted of a bagel with butter and juice. The other meal replaced the butter with peanut butter. The peanut butter bagel resulted in a minimal rise and fall of blood sugar, while the bagel with butter raised the level considerably more. According to the National Peanut Board, men prefer crunchy while women prefer smooth. More than 90% of American households eat peanut butter making it one of the most used food items in the United States. To make a 12-ounce jar of peanut butter, you need 540 peanuts. Peanuts are not actually nuts at all! They are legumes – like beans, peas and lentils. Remember, portion sizes are the key to controlling your blood glucose and avoiding weight gain. So, resist those trips to the vending machine – plan ahead and pack a healthy snack! “Peanut And Peanut Butter Can Reduce Diabetes Risk,” NAPSI, http://www.napsnet.com/articles/72083.html. Baulkman, Jaleesa, “Peanut Butter May Prevent Childhood Obesity; Snacks With Peanuts Positively Affect BMI,” Medical Daily, March 5, 2016; http://www.medicaldaily.com/peanut-butter-childhood-obesity-body-mass-index-376688.